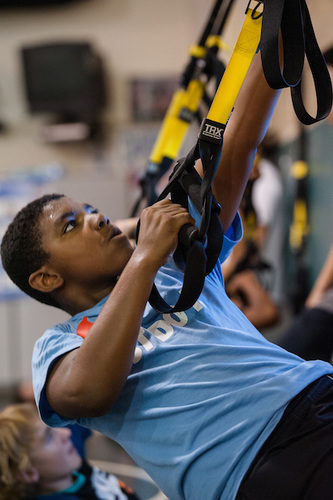 Now in its third year, the summer TRX training camp offers students in grades 6-12 the opportunity to prepare for an upcoming athletic season or simply get fit. The Navy SEAL-developed TRX suspension training system utilizes the user’s body weight to grant them access to a wide variety of exercises that can strengthen core, improve endurance and increase overall athletic performance. This unique system also puts the user in control of how much they want to challenge themselves by adjusting resistance settings and body positions to best suit their fitness goals. This camp will be directed by Harker athletics coach Karriem Stinson, a certified TRX Group Instructor and wrestling coach, who also runs the Harker summer wrestling camp and coaches middle and upper school wrestling. To date he has coached three members of the California national wrestling team and multiple CCS placers. The TRX training camp will take place Mondays and Wednesdays from June 22-July 22, from 4:30 to 6 p.m. Sessions will be held at The Harker School’s middle school campus, located at 3800 Blackford Ave. in San Jose. For more information on this and other sports camps, including pricing, please visit the Harker Summer website.